The American Saddlebred Museum is the ultimate "Showplace for Saddlebreds." 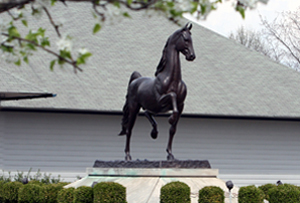 Located on the grounds of the beautiful Kentucky Horse Park in Lexington, KY, the Museum provides an exciting and educational experience. Inside, visitors learn the important role the American Saddlebred played in our nation's history, and how he has evolved into the elegant, athletic, and versatile breed we know today. The Museum features special exhibitions that change annually as well as a wide variety of interactive permanent exhibits, a children's area, award-winning videos, as well as an award-winning movie. The Museum boasts the largest collection of Saddlebred artifacts in the world. Our archives house trophies, photographs, tack, and artwork, including one of the most extensive collections of George Ford Morris Saddlebred artwork. Our research library contains over 3,000 volumes used by our members for bloodline and genealogical research. While the Museum serves as a resource to the Saddlebred industry, it also educates tens of thousands of visitors annually about the beauty, versatility and history of the American Saddlebred horse.